A week or so ago, the birds declared it was spring. We got up one morning, and for the first time since last fall, it was warm enough to enjoy our coffee out on the back deck. When I opened the door, the welcoming confetti of cheeps, peeps, and songs filled me with joy. There were birds everywhere. It was like being in a crowded auditorium where everyone is talking at once, an unintelligible burble that is a bouquet of voices. Only this was much more pleasant. Added to that, it smelled like spring—green—the warmth of the sun coaxing the scent out of everything. Once the weather warms and we say farewell to winter, I want to be outside. Three-year-old Gabby said it best when she told Clint last spring, “I like outside”. Me too. I went outside and trimmed back the skeleton stalks of the sunflowers and hollyhocks. They are the winter guardians, hunching over the garden withstanding rain, snow, and wind that will send seat cushions into the next county. I especially love the remains of the sunflowers, which I cut and keep around the house. I cheated a little with this post. 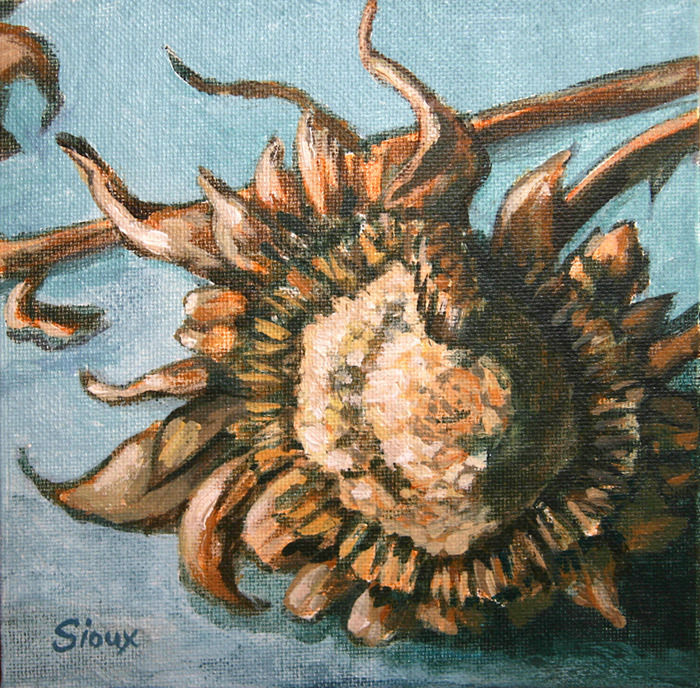 Sunflower is a painting I did last year and sold at my show in November. I thought I’d share it this week in honor of the trimming I did while I continue my work on the next new new painting (sorry, I was outside). Here’s a hint of what’s to come: daffodils. A few of you have asked me about my painting of the creek. It's still sitting in my studio. In fact, I propped it up next to my drawing table so it can get a good look at me while it simmers. In the meantime, I took a stab at another version of the same scene, only this time using watercolor. Lone Pine Creek is akin to a hiking companion on the trail up to Whitney. It meanders across the trail and travels along one side or the other in many places along the journey. 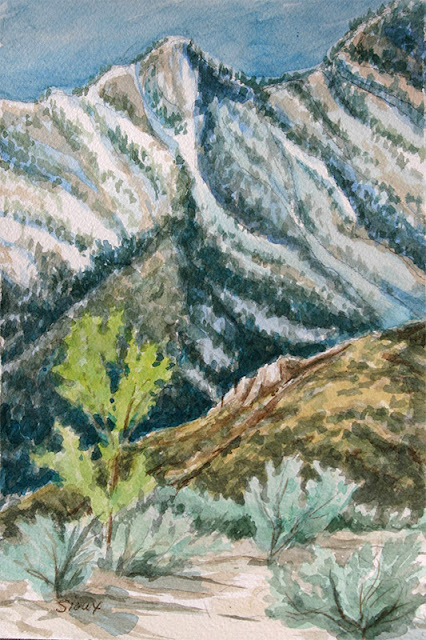 It’s a cheerful constant, whether foaming white with a rainbow mist halo as it tumbles over cirque edges, gurgling gold where it lazily spreads out in the sun, or above tree line where it blackly murmurs over sun burnt rocks fringed with brilliant spikes of green—the only green you’ll see for a while. This was one of those paintings that came together veh-rrrr-ry slowly. Usually I bang out a painting in one or two extended sessions, but this one took shape a little bit at a time over several different studio stints. I'd work on it a little and then set it aside, never fully committed to whether it was a success or not—until this past weekend when I finally opened the door that took me to the finish. I was having one of those days when I didn't know what I wanted to work on. 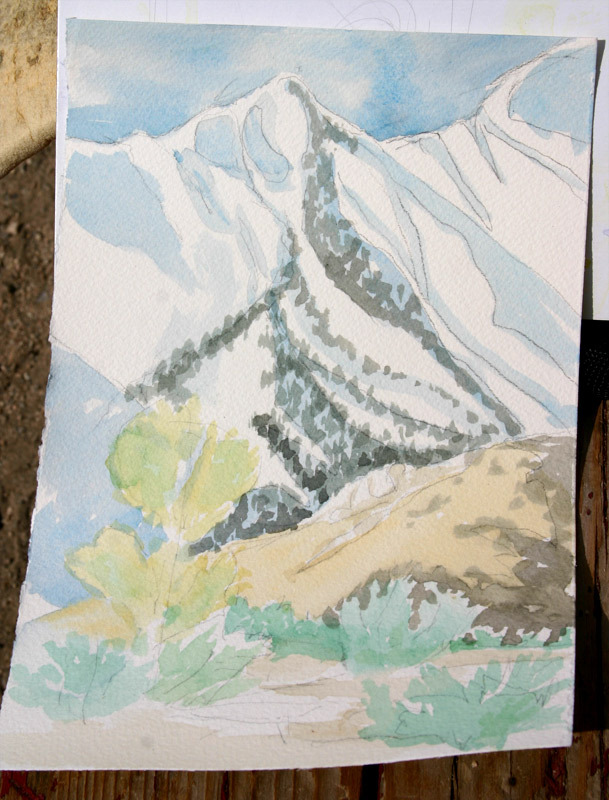 I had a small canvas of the view from Trail Crest out over the Hitchcock Lakes that I'd started back during the Top of the World paintings. Although it was off to a promising start, it went spiraling out of control and had to be put out of it’s misery. And so, I went back to the creek painting. At some point in my dabbling, I added ink to the piece. That turned out to be a good decision, leading to a nice completion. 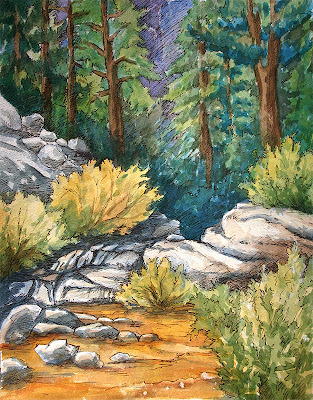 It felt good to express this impression of Lone Pine Creek, particularly this crossing. I know this is just the beginning though, as I explore the other faces of Lone Pine Creek. 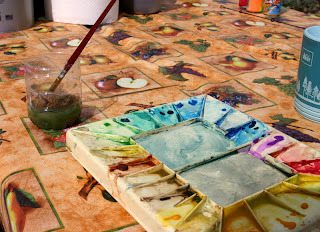 On our recent camping trip to Lone Pine, it was a paint-a-palooza for me. For a change, we didn't run hither and yon, nor hike, we just fished and relaxed in camp. Saturday, we awoke to a sunrise of giant fluorescent-orange doughnut clouds decorating the sky over the Inyos. It was a shot of inspiration. My juices were flowing. Once we'd teased the trout a bit (not the other way around, of course) and had breakfast, I broke out my art gear. Over the next several hours, I started and nearly completed three paintings. 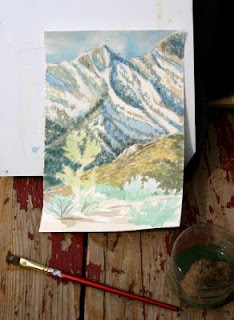 For the first piece, I settled on painting a small segment of the Sierra Nevada ridge to the southwest. It was a mere bump in a series on a long ridge that stepped up to Mt. Corcoran. 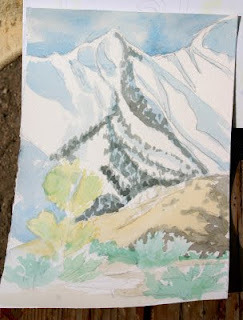 That is truly the challenge when you work outdoors painting landscapes. There is so much to see and choose from—narrowing your focus is not always easy. You can see here I started with a quick pencil sketch to work out the composition, noting the prominent features and shadows. I don't like to spend a lot of time on my drawing because I want the result to be fresh, plus I’m impatient to get my brush on the paper. Ever had a day that seemed to drag on endlessly? Try drawing or painting outdoors and you'll really notice the speed of the sun rolling across the sky and the movement of the shadows (though having fun sure makes the day fly by too). Where was that shadow again? Oh crap, it's gone now. In this next image, you can see I've come a long way, with the vegetation in the background fairly well defined. See my rock in my makeshift water container? Cool, huh? Here is the final image, with the foreground completed and the contrast pumped up. After a giant trout spit my hook, I went back to camp and discovered the incredible color on the Inyo Mountains across the valley. I rushed to the car to get out my painting gear; the light moves fast and I wanted to capture it before it was gone. Unfortunately, my water cup, complements of some Holiday Inn, had sprung a leak. Frantically I looked around for something to put water in besides my coffee cup. Sweet husband came to the rescue, cutting a water bottle in half AND supplying a rock to keep the vessel from blowing away in the sundowner breeze that had kicked up. The Inyo Mountains frame the eastern side of the Owens Valley. To the west lie the Sierra Nevada Mountains. The Yang to the Sierra’s Yin, from a distance the Inyos are unassumingly brown and dusty, old saddle shoes that gladly take what’s left of the moisture dropped by the storms that move through. Up close and personal, they are rugged and richly diverse. 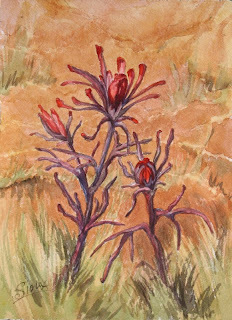 They are forested with piñon pines, juniper, and cactus, with a generous sprinkling of sturdy wildflowers. Further north at higher elevations, you’ll find the breathtaking Bristlecone Forest. In the middle of the day, the Inyos appear bleached out and flat as a cardboard set for a puppet show. As the sun moves to the west, the ridge comes alive with graceful shapes that emerge once defined by lavender blue shadows. Then, as the sun drops behind the Sierra, there is an intense display of rusts and corals, and the shadows cool to a deep purple. By the time I got my gear out, the shadows had climbed up the ridge, leaving just the tops lit by the sun. Fighting the wind, I painted wildly to capture colors I’d seen just minutes earlier. It was lovely. 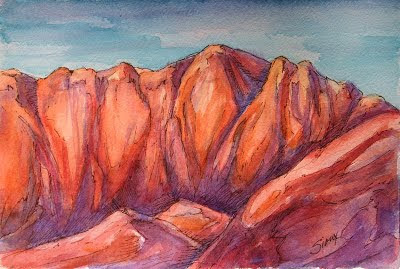 I painted this on location at Spring Valley Ranch near Red Rock outside of Las Vegas. I'm planning to do a little plein-air work in the upcoming weeks. "Oh," you gasp, "I love plein-air painting". I'll bet you love Impressionism too; because that's another “style” most people are familiar with. Aside from modern art (What's up with that Picasso eye-on-the-side-of-the-face thing? My kid coulda done that), Impressionism and plein-air are what most people remember or recognize among the many art styles and sub-styles throughout history. The plein-air style—especially here in the golden state—California Plein-Air rings a bell with most folks, (although it is actually considered a variation of impressionism). Plein-air is the skinny jeans of the art world these days and is often imitated. Ubiquitous as Wal-mart, as stylized as the stick-family decal slapped on the back of every SUV, plein-air has prom queen status and is now the most sought after and miss-identified art de jour. I'm not saying the California Plein-Air painting style is bad. Much of it is beautifully painted. The originators of the style in the 20s and 30s were masters in my mind. There is a freshness and spontaneity that is extremely exciting in a well-done on-the-spot painting. Before it became the epic buzzword of art lovers ("I don't know art, but I LOVE plein-air"), I was hauling my pads, water bottle, palette, paints, treasured extra-soft watercolor brushes, and a bag of gummy bears in a MacWorld tote bag, hiking hill-over-dale in search of the perfect spot. Which, in addition to inspiring scenery should include: easy access to a bathroom or private bush, no ant hills, semi-dry ground, and be located far enough away to give you solitude, but not too far away to be heard if you must yell for help. Someone! Help! Please! I can't get the cap off my Alizarin Crimson! Give me those things, or at least most of them—location, bathroom/bush, and a bite-free place to sit—and I am the happiest girl in the world. I could sit for hours and watch the light change, listen to the birds, and paint my heart out. And I've done that a time or two hundred. Once I sat in Devil's Punchbowl and painted the milky morning light, then the heat of noon on bleached-bone rocks, and finally, the afternoon glow of the setting sun. Aside from missing the trail and having to climb straight up over treacherous rocks (snakes!) to get back to my car, it was a perfect day. I don't get the opportunity to sit outdoors and paint as often as I'd like, but when I do, it is a soul-soothing treat like no other. I'm really looking forward to this time and I’ll share what I do with you when I return.